How to just see one instance of a recurring task in a Smart List. When you create a Smart List based on a category or label it often happens that this includes a recurring task. Since recurring tasks get created far in advance, you often have a ton of the same tasks in this list. But if you want to work from this list (via the Matrix, custom sidebar etc.) you only want to see one instance of the task. And only if the task has already become available to work off. So a recurring task that is scheduled for next week should not show up either. 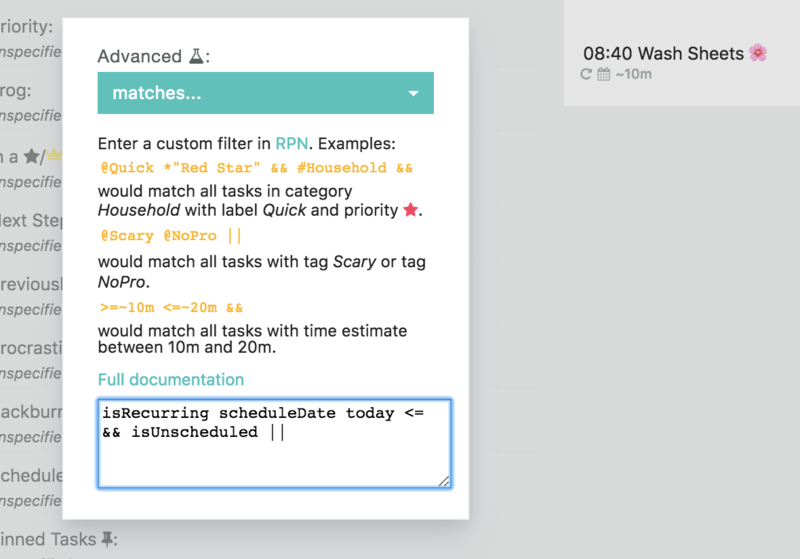 To solve this you want to create an advanced filter that only shows you tasks that are either unscheduled (to include all the tasks from the Master List) or scheduled for either today or before (to only take the available instances of the recurring task!). This works because recurring tasks are always scheduled by default. the additional filter that now gets applied only shows you recurring tasks that are either scheduled before or for today (today <=). Similarly you can remove the "isRecurring" to not see any tasks that are scheduled for the future, not just recurring tasks! This will give you everything either scheduled for today or before or anything unscheduled. Use the other filters as normal. All the filters by default use the AND operator. So a task or project has to pass ALL the filters for it to get shown. The other alternative that works in some instances is to change the recurring pattern of the task so the next instance only shows when you check off the previous one. Depending on the recurring task this makes sense or not.